What’s a party without taco dip? 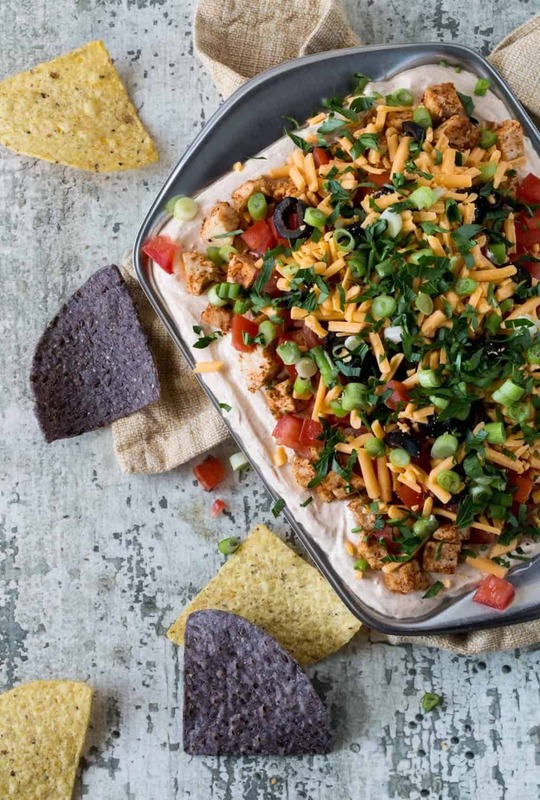 This make-ahead, layered Chicken Taco Dip is just what your game day menu needs! 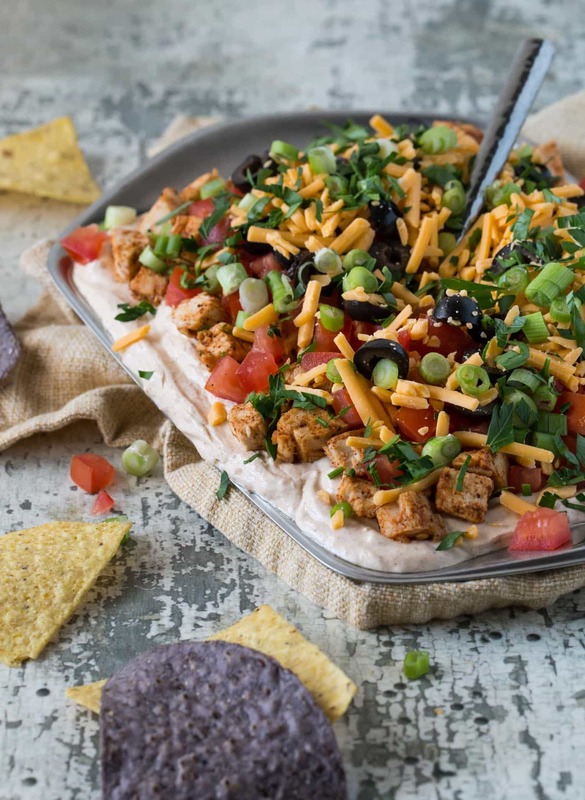 Football and dips go hand in hand, and this flavorful Chicken Taco Dip is no exception. Everyone loves it, young and old alike. Seriously, who can resist chip after chip full of taco-flavored sour cream, seasoned chicken breast, chopped tomatoes, and cheese with a generous sprinkling of cilantro? 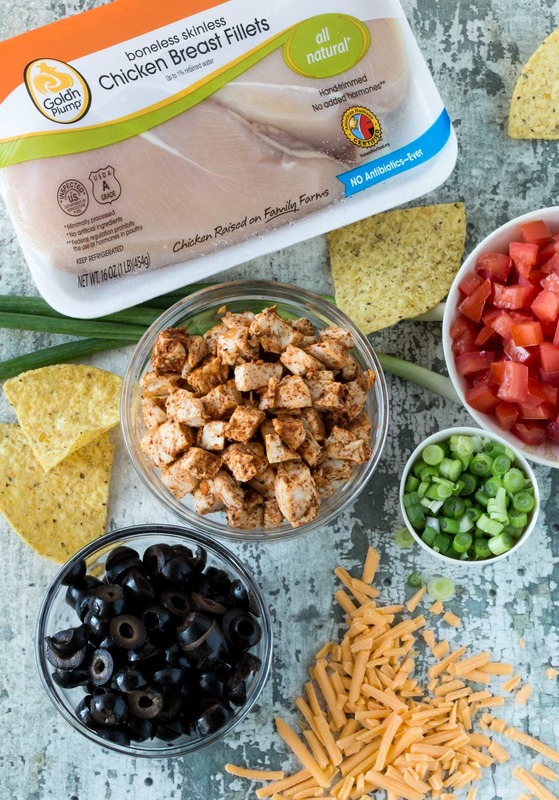 This easy Chicken Taco Dip tastes fabulous as is, but it can easily be altered to match your personal tastes. Love avocado? Add a layer of diced avocado that has been tossed in fresh lime juice. Are olives not your thing? Take them off and swap in some jalapeños instead. Not a cilantro fan? It tastes just as great without it. The sky is the limit with this versatile dip. So what are you waiting for? Don’t make any ordinary taco dip. 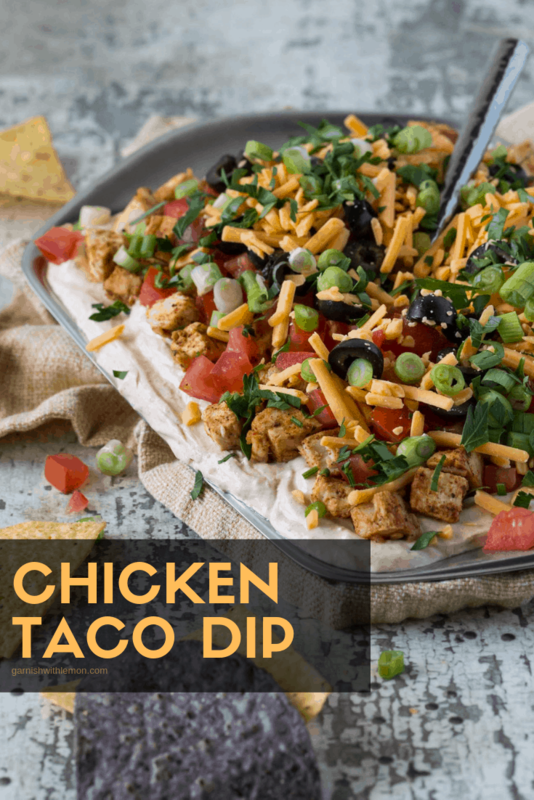 This Chicken Taco Dip is a sure-fire way to make your game day menu a hit with everyone. Disclaimer: This post was sponsored by Gold’n Plump®. All opinions are our own. Thanks for supporting the brands that make Garnish with Lemon possible. What's a party without taco dip? This Chicken Taco Dip recipe is guaranteed to disappear! In a small bowl, combine cream cheese and sour cream and mix until smooth. Add 4 tablespoons of the taco seasoning and stir until completely combined. Place diced chicken breast in a small bowl and toss with remaining 2 tablespoons of taco seasoning. Spread the seasoned sour cream mixture in a 9 x 9 serving dish or similar size. Add the seasoned diced chicken to the top. Layer with the diced tomatoes, sliced olives, cheddar cheese, green onions and top with cilantro. Refrigerate until serving.